As a novelist, I often enjoy allowing the themes in my stories to develop organically. The themes of religion and spiritism, among others, run through A Decent Woman. My main protagonist, Ana Belén, an Afro-Cuban midwife born into slavery, was raised in the Yoruba tradition, which is not the same as voodoo or practicing black magic. Ana speaks to the spirits of her ancestors and to the orishas, the gods and goddesses of her Nigerian ancestors, as she prays the Catholic rosary and honors the Blessed Mother of God. Serafina, a devout Catholic and one of Ana’s midwifery clients, becomes her best friend later in life. Both women are baptized Catholics and although they share a great devotion to the Virgin Mary, Ana continues to practice the Yoruba tradition, so as to cover all bases in protecting herself and her clients, which was common. I spent many years of my childhood in Puerto Rico–my religious and spiritual life was a mix of religion, spirituality, with a good dose of superstition thrown in for good measure. All through my childhood, I attended Catholic schools and went to Mass every week. As a teen, I visited a psychic after my first boyfriend died in a motorcycle accident, and I still pray the rosary in the car when I travel. I check my monthly horoscope, as well…perhaps like Ana, I’m still trying to cover all my bases. “I was young. Thankfully, it was early enough in the day for me to find a safe place to sleep before the sun went down. At first, I was confused; I had no idea the Church considered our Yoruba traditions black magic,” she said. “It is the religion of my ancestors. “But, you do believe in God y la Virgen?” asked Serafina, watching her closely. “You’re giving me your turn?” Emilia nodded. Ana made the sign of the cross before pushing aside the heavy, black velvet curtain. She sat in the chair closest to the entrance and looked around the medium’s reading room. The only source of light emanated from a single candle on the small table in front of her that also held an ashtray, a small stack of mismatched sheets of paper, a stump of a pencil, and a bowl of water. To the right, Ana saw a small bookcase stuffed full of old, dusty books with titles she couldn’t read without sufficient light. The room was probably crawling with spiders, she thought. She looked down, expecting to see a huge insect crawling up her leg, and then she stomped on the floor to deter any bugs. Sometimes a visit to crazy town is necessary. Earlier this week, nearly twenty days after my debut historical novel, A Decent Woman was published, I set about creating a to-do list that included, answering emails, writing articles for ezines, replying to author interview questions, and trying to keep up on social media sites I’m part of. The list of what I needed to accomplish post-publication seemed overwhelming, and I didn’t expect to feel new, strange emotions–I was a bit disoriented, and felt flustered and overwhelmed. The book I’d worked on for five years was no longer in my hands–it was in readers’ hands. All I could do was stand on the sidelines and watch my protagonists, Ana and Serafina, take over–it’s their story. At this point, my book, the story, must stand alone. I just happened to write it. But, of course, I got in my own way. When A Decent Woman first came out, I was overwhelmed with feelings of pride and joy, much like a parent when their firstborn goes off to school. I was grateful to Booktrope Publishing for taking a chance on an historical novel about an Afro-Cuban midwife, who lives and works in Puerto Rico, and thankful to my publishing team, who were a dream to work with on this project. I was thrilled and grateful when readers left wonderful comments and reviews. I was humbled and felt dizzy. Much like my experiences when my adult kids left the nest, who are doing wonderful things in the world, by the way, I knew post-publication that it was time to get a life. I realized I had to write another book, but how? I couldn’t concentrate, and in the first ten days, I obsessively checked Amazon, looking for new reviews so I could thank the kind reader (if I knew them). Checking my rankings on Amazon was a daily ritual, which I didn’t know how to do until my marketing guru, Anne told me where to look. Then, I realized being a best selling author is an hourly thing, and I soon gave that up. I now look weekly and hope that stops. During the first ten days, I found it difficult to have ‘normal’ conversations, and discovered it was extremely difficult not to mention my debut novel to the mailman, the guy at the post office as I mailed out copies of my book, and to the guy behind the deli counter, who loves historical fiction. I went a bit nutty reminding my very kind and tolerant family members and friends not to forget to post an honest review for A Decent Woman on Amazon. Sheesh. I was sick of me, and this isn’t me. Although I know how important social media is, and how very important reviews are to an author, I lived alone for five years, writing and rewriting a story that loved. In the pre-publication days when I was writing, I wouldn’t speak to a soul for days on end, save for a quick phone call, emails and texts to family and friends to catch up and let them know I was alive. I did talk with my cat and my Chihuahua, Sophie, who as it turns out, is an extremely good listener if you don’t mind her licking your face. I knew how to do all that. I just didn’t know how to be humble and a social animal, when all I wanted to do was write more books. Life is all about balance, and I wasn’t feeling particularly balanced right after publication. So, I wrote an email to my friend and writing mentor to many writers, including myself, the master storyteller, Jack Remick. Sensing that I was experiencing, as he calls it, “Firstitis”, he kindly wrote back with a diagnosis that was spot on. He gave me the definition of this curable illness and the cure–get back to writing. Immediately. He was absolutely right. It was sage and timely advice from an incredibly talented writer and a composed, generous man to a discombobulated, but well meaning, new author. Thank you, Jack. The craziness has diminished. I’m getting down to the business at hand–writing my second book–and I’m at peace. I should have written sooner, but I learned valuable lessons, and I’ve always learned the hard way. Ana Belén, you are on your own, my love. I’m onto The Island of Goats, my second historical novel set in 1920 Puerto Rico and Spain. I’m getting to know my characters, Alta Gracia and India Meath, and accessing my experiences on the medieval route of El Camino de Santiago de Compostela, The Way of St. James, in Spain, which I walked with my then-teenage children. But, I’ll see Ana and Serafina again when I get to writing the sequel to A Decent Woman called Mistress of Coffee. Sometimes, you must visit crazy town to find peace and sanity again. Puerto Rican-born novelist, Eleanor Parker Sapia, was raised in the United States, Puerto Rico, and Europe. Eleanor’s life experiences as a counselor, alternative health practitioner, a Spanish language social worker, and a refugee case worker inspire her stories. When Eleanor is not writing, she facilitates creativity groups, and is making plans to walk El Camino de Santiago de Compostela a second time. 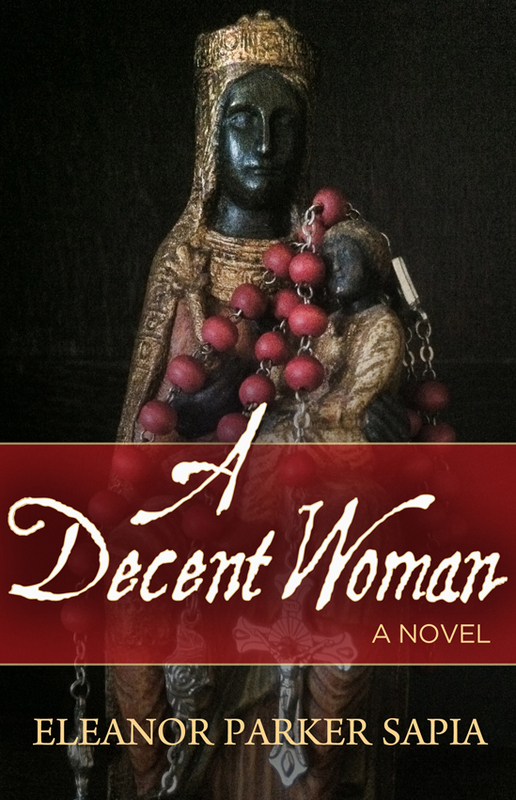 A Decent Woman is her debut historical novel. Eleanor is the mother of two adult children, and she currently lives in West Virginia. Serafina is a respectable young widow with two small children, who marries an older wealthy merchant from a distinguished family. A crime against Serafina during her last pregnancy forever bonds her to Ana in an ill-conceived plan to avoid a scandal and preserve Serafina’s honor. Set against the combustive backdrop of a chauvinistic society, where women are treated as possessions, A Decent Woman is the provocative story of these two women as they battle for their dignity and for love against the pain of betrayal and social change. Posted on March 13, 2015 March 27, 2015 Categories fiction, literary fictionTags #internationalwomensday, #latinolit, #WeNeedDiverseBooks, #womenshistorymonth, A Decent Woman, author, author blog, blogger, book, book cover, book launch, book marketing, book review, books, Booktrope, Caribbean fiction, caribbean literature, challenges, colonial Puerto Rico, Cuba, debut novel, feminism, Hispanic fiction, Hispanic literature, historical novel, Latin American fiction, latina, latina author, new book, new release, Puerto Rico, reviews, the writing life, women's issues, writer, writing6 Comments on Sometimes a visit to crazy town is necessary. I was going about my day as usual, when my book manager emailed to tell me A DECENT WOMAN was live on Amazon! I am thrilled beyond words, very emotional, and I’ve popped open a bottle of champagne I’ve been saving! CHEERS! To five long, amazing years of writing and researching A Decent Woman! Ana finally has her day! I love you, Ana and Serafina! Do you know what my first thought was? I wish my Mom and grandmother were here with me today to celebrate this happy day. My second thought was to call my children, but my daughter was at work and my son lives in Holland. So, I texted my beautiful daughter and emailed my handsome son! THANK YOU to my family and friends who’ve supported me for five long years. I love you all! Thank you for visiting today. I hope you will enjoy A DECENT WOMAN well enough to write an honest review of the book. Thank you! 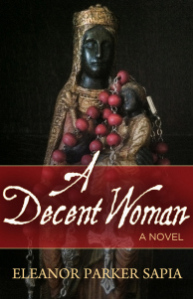 CHARACTER INTERVIEW with Ana Opaku Belén from Eleanor Parker Sapia’s historical novel, A DECENT WOMAN. Part of the Historical Novel Tour, hosted by the fabulous author, Tiffani Burnett-Velez. https://tiffaniburnettvelez.wordpress.com/ Thank you for having me,Tiffani! My Nigerian-born parents were captured and sent to the new world on one the last African slave ships that landed in Cuba. I was born a slave on a sugar plantation in Camaguey Province, Cuba in 1860. I say I was born twice—once when my mother gave birth to me, and the second time when I fled Cuba under mysterious circumstances in 1880 on a freight ship that landed at the Port of Ponce, in Playa de Ponce, Puerto Rico in the middle of the night. It was a second chance for me; a rebirth. In 1860, Cuba produced nearly one-third of the world’s sugar, and my parents worked in the sugar cane fields of a Spanish-owned sugar plantation between Las Minas and the port of Nuevitas. Near the end of my mother’s pregnancy with me, she was sent to work in the land owner’s house kitchen. Abraham Lincoln became President of the United States the year I was born, but of course I didn’t know who he was, or what he would do for those born into slavery until many years later. What was Playa de Ponce like during the first ten years after you arrived? The last half of the 19th century was marked by the Puerto Rican struggle for independence and the abolition of slavery, which was abolished in Puerto Rico by the Spanish National Assembly on March 22, 1873. The owners were given 35 million pesetas, and slaves were forced to continue working for three more years. I arrived in Puerto Rico in 1880 as a free woman and lucky for me, I met a midwife who trained me as a midwife. When Doña Milagro (her name means, miracle) passed away, I took over her business and became the only midwife in Playa de Ponce. I was very fortunate. At that time, the main currency was the Puerto Rican peso, and the US dollar was appearing as well as foreign currency from merchants doing business on the island. Although Barrio Playa was a bustling port town with many grand homes and mansions owned by wealthy merchants, and many government buildings, I lived in relative poverty in a little, wooden house near the Caribbean Sea. I was illiterate until the early 1900’s when I met my friend, Serafina, another character in Eleanor’s book whose baby I caught, taught me to read. In 1898, all Spanish-born governors were appointed by the Spanish crown, and the population was a mix of white, black, mulatto, and criollo, creole. There was an undercurrent of dissatisfaction with Spanish rule, and the Puerto Rican educated elite were making their voices heard, but their efforts were always squashed and silenced by the Spaniards. There was talk of the Americans fighting the Spanish crown for possession of Cuba and Puerto Rico, and it came to pass—in 1898, the United States declared war under President William McKinley, and soon afterward, Puerto Rico was ceded to the United States at the end of the Spanish American War. The Americans invaded Puerto Rico on the shores of the town of Guánica on July 25, 1898 under the command of General Nelson Miles. When Hurricane San Ciriaco nearly decimated the island two months later with twenty eight days of rain and high winds, I wondered if the Americans regretted their decision to invade and control Puerto Rico. The hurricane claimed 3,433 lives, and caused widespread disease, poverty, famine, and left millions of dollars of crop damage. It was a miracle I survived, and there were many more hurricanes and tropical storms to come, and an earthquake in 1918. What was the situation for women in Ponce, Puerto Rico in your time period? For me and many poor, uneducated, black and mulatto women, the situation was dismal, but I managed to keep a roof over my head and food in my cooking pot because I caught babies. But many times, I didn’t charge for my services as I knew most of my clients couldn’t afford to pay me. We used a barter system, which was how I survived. Women had few rights in those days, and even the high class women had a difficult time as is life in a male-dominated society. Women’s first obligation was to their husbands, who kept them and their children protected and safe. It became difficult for women to keep other women away from their men, as all women looked for the same protection and good futures for themselves and their children. Men pit woman against woman, which was a shame in my eyes, but I understood the battle of these women. What advice in life might you give to young women today? In my advanced age, my advice to young women is simple—live your life with integrity, compassion for others, strong faith, and strength of character. Our character and integrity should be impeccable, and never choose a bad man over a good girlfriend. Women need a strong village in life, and that is why in Puerto Rico, women refer to each other as ‘comadre’, which has many meanings. A comadre could be your midwife, the godmother of your child, and it is often used to refer to a very close person to the family, a best friend. Serafina and I are comadres in every sense of the word. Thanks so much for the creative interview questions and for inviting me on the Historical Novel Blog Tour, Tiffani! I enjoyed sitting in Ana Belen’s chair today! All the best to you! A DECENT WOMAN is coming early March, 2015 with Booktrope Books.